Natasha Lewer has recently returned to the UK from Bangladesh. 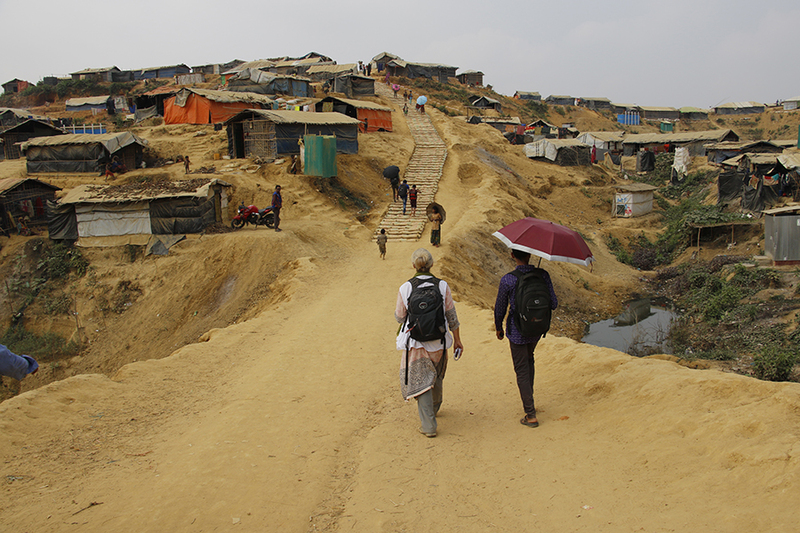 She blogs about her time with nurse Chrissie McVeigh inside Kutupalong refugee camp as Médecins Sans Frontières / Doctors Without Borders (MSF) raced to vaccinate as many children as possible against diphtheria. It’s 8 am on a day in late March and a crowd has gathered outside the gate of MSF’s hospital in Kutupalong, Bangladesh. They are all Rohingya volunteers, ready to take part in the final day of a mass diphtheria vaccination campaign in the largest of the refugee camps in eastern Bangladesh, home to an estimated 300,000 people. In their midst stands MSF nurse Chrissie, with clipboard, rucksack and shalwar kameez, orchestrating the day’s activities. In two minutes they are off, at speed, dodging rickshaws and overloaded lorries, down the busy roadside towards the entrance to Kutupalong makeshift camp, a vast, dense maze of huts that spreads across the hills into the far distance. "This is the beginning of a seven-hour journey on foot, up and down steep hills, across bamboo bridges, crisscrossing the camp." For Chrissie and the outreach team, this is the beginning of a seven-hour journey on foot, up and down steep hills, across bamboo bridges, crisscrossing the camp and reaching its very furthest edges – all at the peak of the hot, dry season. Diphtheria broke out in the camps in December 2017 – the first major outbreak of the disease for decades. Airborne, it spread fast through the crowded camps, infecting 6,000 people and causing 40 deaths, most of them children. The current vaccination campaign, organised jointly by the Bangladeshi Ministry of Health, the World Health Organization (WHO) and MSF, will ensure such an outbreak cannot happen again. The Ministry of Health has taken the lead on the practical side of the campaign, providing teams of vaccinators, overseeing the cold chain (the vaccines are sensitive to heat and must be kept cool to be effective) and distributing the vaccines. The WHO has provided training and data collection, alert to any areas that might have been missed. MSF’s role has been to provide logistical support and additional vaccination teams, to mobilise the community, and – most importantly – to formulate the plan. “What exactly is the plan?” I ask Chrissie. “Simply to vaccinate as many children as possible,” she says. From every hillock in the camp, you can spot a handful of the 62 vaccination sites, each flying a yellow flag. Each site is staffed by a team of 10, and each team will aim to vaccinate 350-400 children in the course of this final day. “If we can vaccinate 25,000 children today, we will have reached our target,” says Chrissie. Most of the Rohingya refugees in Bangladesh did not receive even basic healthcare in Myanmar. They have no experience of vaccinations. As a result, rumours abound, with some people believing that the needles will tattoo their children’s skin, amongst other things. Such misinformation and distrust within the community means that the ground had to be prepared carefully before the campaign kicked off. 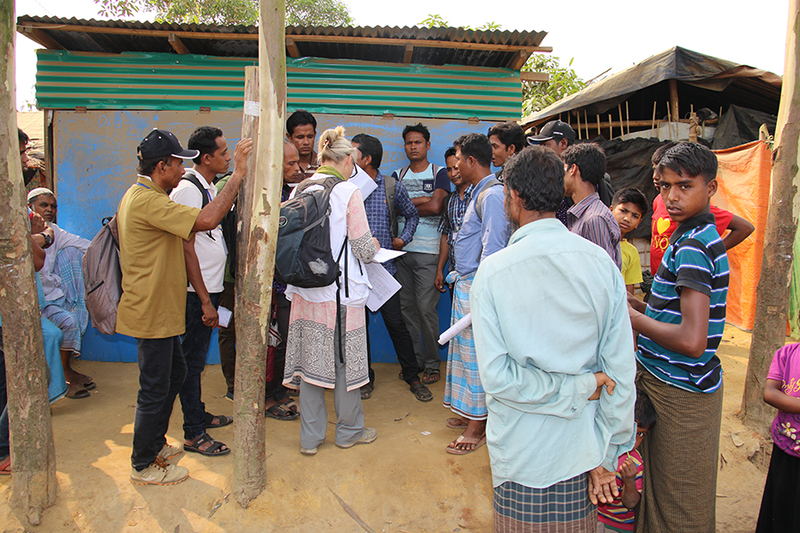 MSF enlisted the help of 100 Rohingya volunteers, all of whom live in the camp and know it intimately. With his co-volunteers Zakhir and Shamshu Alam, Ruhul approached the head imam, followed by other religious and community leaders, to convince them of the importance of the campaign. Only with their approval could they be sure that people in the camps would allow their children to be vaccinated. "The smaller ones howl, squirming on elder sisters’ laps, but the older ones smile stoically as they receive their jabs." By way of encouragement, a volunteer with a megaphone tours the area, reminding people in a booming voice that this is their final chance to protect their children from diphtheria. Inside the hut on the top of the next hill, Alif and Sarmin are checking immunisation cards and vaccinating a line of children. The smaller ones howl, squirming on elder sisters’ laps, but the older ones smile stoically as they receive their jabs, then hold out little fingers to have their nails marked with black felt-tip pen. The aim is to vaccinate all children aged between six weeks and 15 years. As many of the older girls are reluctant to venture out in public to the vaccination sites, female vaccinators like Sarmin gather all the teenage girls in the neighbourhood together in one house and vaccinate them in private. Chrissie and Ruhul pick their way towards the next site, along narrow paths around the backs of houses, up slippery slopes and around the edges of small valleys planted with rice and other crops. They pass door-to-door salesmen, shops selling groceries and boys hauling sacks of firewood. Everywhere there is activity in the camp, as its residents prepare for the upcoming rainy season – frequently they step aside to make way for men balancing bundles of bamboo poles on their shoulders and children collecting buckets of mud for house repairs. The last stop is the distribution point back near the main road, where the teams meet to hand over their tally sheets from the day. Dr Jobayer of the WHO puts the data straight into his computer. He confirms that, over the three rounds of the campaign, a total of 340,000 children have been protected against diphtheria in the Kutupalong-Balukhali megacamp – a remarkable achievement. If you live in the UK, please donate to MSF UK’s winter 2018 appeal to support our work with Rohingya refugees in Bangladesh. If you live elsewhere in the world, please click here to make a donation.